Weight gain at age 56 is caused by a variety of factors, such as inactivity and eating more calories than your body needs. However, losing extra pounds is important to your health. It can reduce your risk for coronary heart disease, stroke and high cholesterol, according to the U.S. Department of Health and Human Services. A few lifestyle changes will help you accomplish your weight-loss goals. At age 56, you need at least two hours and 30 minutes of moderate activity weekly, recommends the Centers for Disease Control and Prevention. 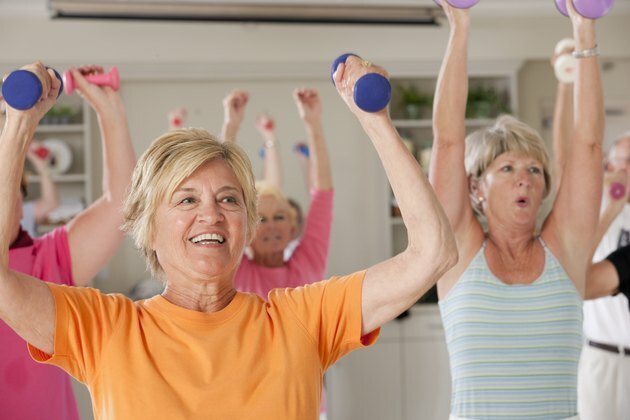 Moderate activity includes exercise such as water aerobics or taking a walk. When moderate activity isn't challenging any longer, switch to vigorous activity. Instead of two hours and 30 minutes, you need only one hour and 15 minutes of vigorous activity weekly. Vigorous activity includes exercise such as jogging, running, playing racquetball or playing singles tennis. You also need to plan at least two strength-training sessions weekly. Strength training burns calories and promotes weight loss. However, as you age, muscle loss occurs. If you don't engage in strength training, the muscle loss is replaced with fat. Regular strength-training sessions stop this from occurring. Workout sessions need to last 20 to 30 minutes and target your major muscle groups, including your hips, abs, legs, back and chest. At age 56, you need fewer calories than you did in your 30s and 40s. Calorie needs decrease to 1,800 daily for women who participate in moderate activity. Women who select vigorous activity need 2,000 to 2,200 daily calories, according to the American Heart Association. Men generally need more calories than women. A 56-year-old man needs about 2,200 to 2,400 calories with moderate activity and 2,400 to 2,800 calories with vigorous activity. Discuss an appropriate level of activity with your medical provider. Even if you're eating healthy, it's possible to gain weight if you eat too many calories. This occurs when you aren't monitoring portion control. Pre-measure foods to ensure you aren't overeating during your meal. When a measuring cup isn't available, use visual cues to estimate food serving sizes. For example, eat a serving of protein the size of a deck of card. When eating cheese, think about eating the size of your thumb. Eat a serving of pasta or rice the size of an ice cream scoop.